The Festival of the Ermita de las Tres Cruces is held in Almogía, a municipality in the Valle del Guadalhorce. Within its popular culture and tradition, the highlights are the verdiales (folk dances), one of the oldest folk traditions in Europe. So much so that the town is considered to be the "Cradle of the Verdiales". The festival will be held in a unique setting, the Ermita de las Tres Cruces (Hermitage of the Three Crosses), located in a rural area divided by the river Campanillas. This settlement is located between the municipalities of Almogía, Álora, Cártama and Pizarra and dates from the eighteenth century. The festival takes place every year on the first Sunday in May. 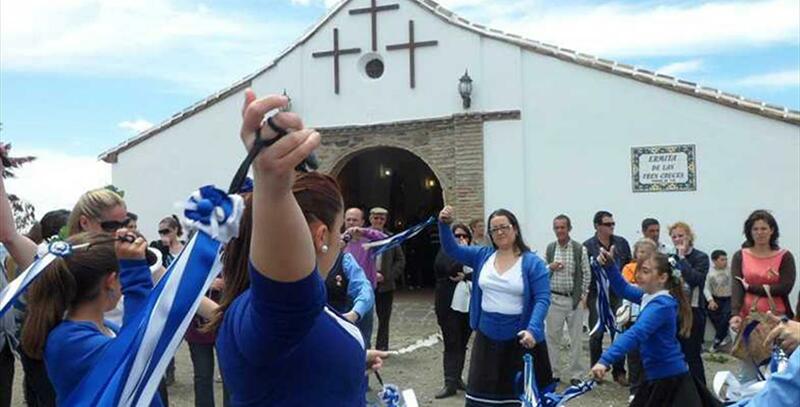 There will be various performances by verdiales groups, Churripampa dancing and tasting of typical local produce. It is a festival of National Tourist Interest in Andalusia and aims to maintain the tradition of the verdiales and other musical genres which originated in Malaga.